We call it Santa Barbara Chic with a mix of Spanish architecture, a few Moroccan accents and a bit of modern contemporary for todays living. 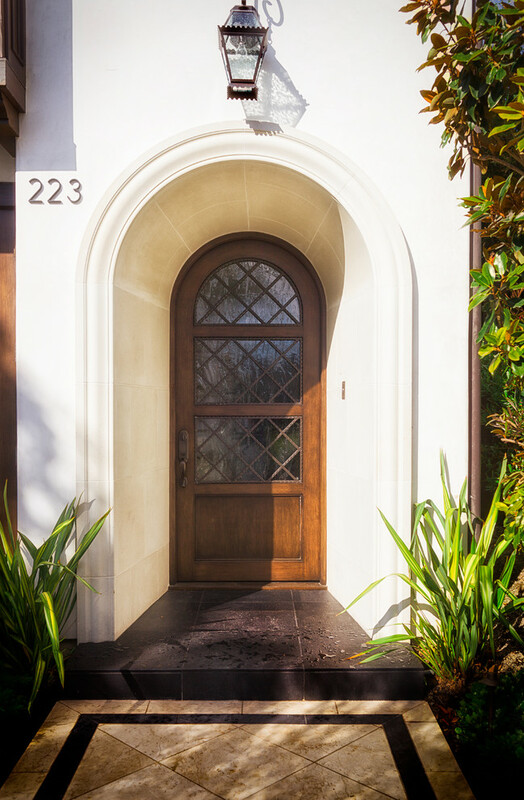 This Santa Barbara style design in Corona del Mar with a wine room and a roof top deck easily lends itself to entertaining and exudes a sophisticated, relaxed style. We wanted to create the perfect transition between indoor and outdoor living that clients in this area are so accustomed to. Most of the furnishings in the residence were custom-made, such as the living room media cabinet with leather upholstered doors and nail head trim. The living room cocktail table is comprised of two separate pieces: a table and a tufted ottoman, which can be pulled out for extra seating when entertaining guests. The custom designed dining room furniture mixes bold, contemporary pieces with more relaxed traditional pieces and is set against floor to ceiling glass doors that open to an outdoor living wall and water feature. In the chef’s grade kitchen, a custom hand painted back splash created a graphically subtle backdrop that balanced the light and dark finishes in the room. Caesar Stone countertops were specified along with professional series Sub Zero and Viking stainless steel appliances. The master suite is ideal for relaxation with custom bed linens and a spacious seating area. 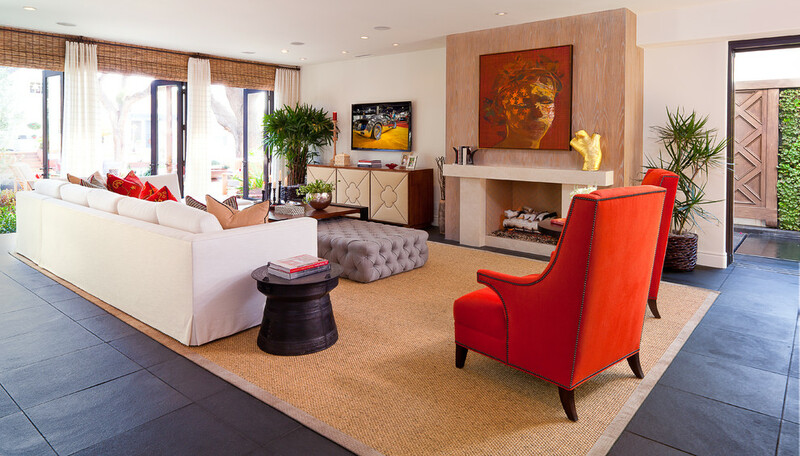 The focal point in the room is the art piece over the Venetian plaster fireplace. The side patio with access to the kitchen by way of floor to ceiling pocketing doors offers the perfect transition between indoor and outdoor living. The various outdoor living areas provide ample room for entertaining and unwinding. 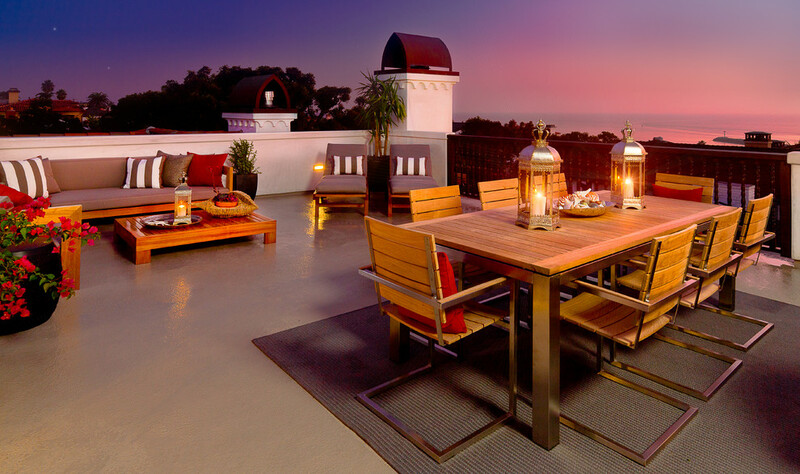 The roof top deck is the perfect place for watching the sunset. Contemporary teak wood furniture throughout creates a relaxed atmosphere for dining and lounging.